Some time ago I was starting to learn OSGi. Every now and then I would have liked a simple test setup to play around with bundles, services a.s.o. So eventually I have decided to create one myself and publish it. 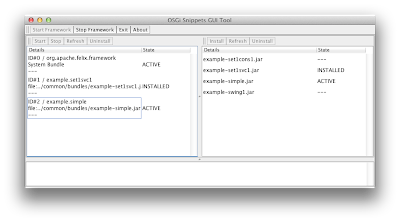 The guitool can start an OSGi framework and stop it. It observes a directory and list the bundle files on the right hand side. 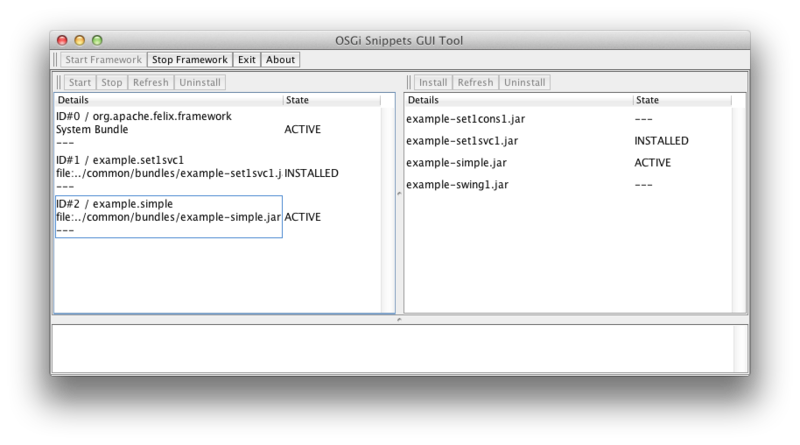 It observes the OSGi environment and lists the bundles on the left hand side. With a button click one can install the bundle files, start or stop the bundles a.s.o. The sources are licensed under a BSD-2-Clause license.